Net income was up 23% for year to $1.3 billion on 11% rise in revenues to $6.1 billion; client assets up 10% to $2.46 trillion. Schwab topped analysts' estimates with its Q4'14 results. Charles Schwab Corp. announced Friday records in annual revenue and net income for 2014, and record net income for 2014’s Q4. For the year, Schwab (SCHW) had a 23% increase in net income on an 11% rise in net revenues. In the fourth quarter, the company posted net income of $350 million, up 10% from 2013’s fourth quarter, on an 8% rise in net revenues to $1.55 billion — topping analysts’ estimates. For the year, the San Francisco-based company had net income of $1.32 billion on revenue of $6.05 billion. As for its industry-leading RIA custody business, Schwab Advisor Services (SAS) ended 2014 with a 10% annual rise in client assets to $1.112 trillion; assets in Schwab’s retail business, Schwab Investor Services, also rose 10% year-over-year to $1.315 trillion. In a statement, CEO Walt Bettinger said the company received $124.8 billion in net new client assets during the year, “marking the third consecutive year of core net new assets in excess of $100 billion.” The advisor-services unit was responsible for $65.7 billion of the ’14 net new flows. In addition, Bettinger noted that Schwab had $1.23 trillion in client assets that “were enrolled in some form of ongoing advisory service” at the end of 2014, a 12% increase from year-end 2013. Recounting the company’s performance in 2014, Bettinger said Schwab is “positioned for more innovation in 2015 as we continue our work to make quality help and advice available to a broad spectrum of investors.” In particular, Bettinger mentioned the planned first quarter launch of Schwab Intelligent Portfolios, the company’s foray into the automated advice, or robo-advisor, space. Asset management and administration fees grew 9% to a record $2.5 billion during the year, he reported, and while trading revenue was flat, “overall revenue growth and careful expense management enabled us to increase our investment in client-related projects by 9% to a record $188 million while still achieving a 350-plus basis point improvement in our pre-tax profit margin,” to 34.9% for the year. The company’s financial results for the fourth quarter and full-year 2014 included two non-recurring items resulting in $20 million in net proceeds related to Schwab’s non-agency residential mortgage-backed securities (RMBS) portfolio, held since the financial crisis at Schwab Bank,. In written commentary on those items, CFO Martinetto said they came from “net litigation proceeds of approximately $28 million and net losses of $8 million from selling securities totaling approximately $500 million. Taken together, these items increased pre-tax income by approximately $20 million, or $.01 per share. 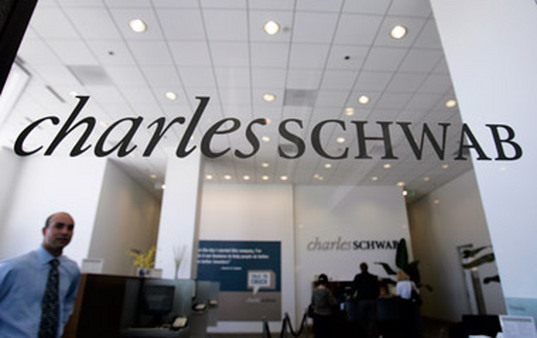 He said Schwab will continue to “pursue vigorously” its legal claims on those securities, but said there is “limited remaining downside” on the remaining $15 million in RMBS, which he said the company has marked to market and recorded a $0.6 million charge in 2014’s fourth quarter.